Arched bays for trucks and ladders remain intact in the old brick firehouse in the heart of Gaithersburg’s Kentlands neighborhood. But in place of garage doors are curtained cedar windows, wood paneling and a mahogany front door. A broadly curving deck extends off the back, and a second-floor balcony projects from one side. The domestication of the firehouse into living spaces for a family of four has resulted in one of the most unusual homes in the New Urbanist community. Alexander and Jackie Krakovsky bought the fire station in 2013 from the city of Gaithersburg for $200,000. They spent about $800,000 to convert the two-story structure into their family home and add a free-standing two-car garage. They moved into the renovated landmark about a year ago but have yet to decide how to use some rooms. “We kicked the contractor out as soon as we could so we could move in, but we’re still figuring it out,” says Alexander Krakovsky, 49, a real estate developer and co-founder of a power company, who points to unfinished areas of the basement and in-law suite at the side of the house. The firehouse was built by Otis Beall Kent, whose estate was turned into Kentlands, to house his collection of antique fire engines. The 1961 building incorporated a 1900-era carriage house and a greenhouse. 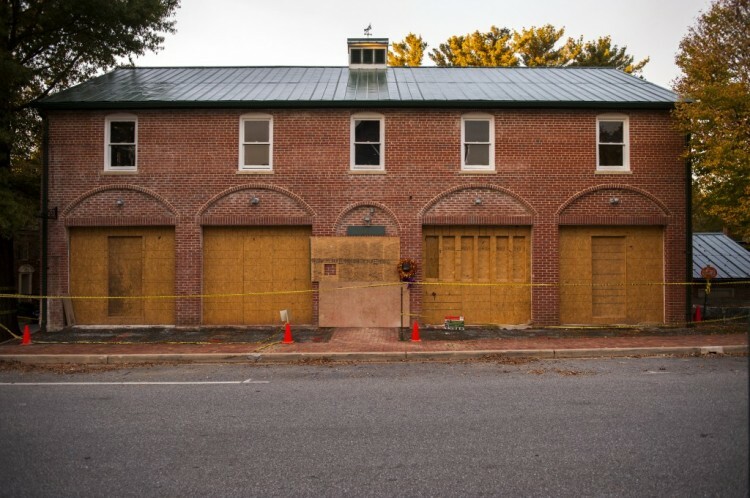 After acquiring the property in 1992, Gaithersburg designated the firehouse a historic resource and, in 2013, selected the Krakovskys’ proposal to turn the dilapidated structure, located across the street from the Gaithersburg Arts Barn, into a single-family house. Once rigidly divided into compartments for trucks and equipment, the main floor is now open and bright with some walls painted lime green or a pale orange. Cinder-block partitions between the truck bays were demolished to create a kitchen open to the dining and living areas at one end. Concrete walls were replaced with steel columns and beams to support the structure and help define various parts of the interior. One of the kitchen posts is clad in walnut; another, encased in drywall, abuts a gas fireplace between the kitchen and living area.